We've been working on doing more hiking with our kids this summer. It's not always easy, but the kids are starting to enjoy it, even when they're tired (or maybe they just enjoy the snacks I bring along). 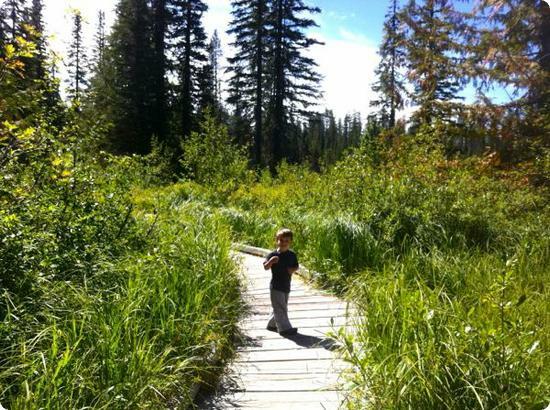 What tips do you have for hiking with kids? IELTS in Navi Peth on July 20, 2013 at 3:11 a.m. Very Nice Picture.The Background & locations are Very great. Dana on July 22, 2013 at 2:18 p.m.
Beth Henry on July 25, 2013 at 2:41 p.m.
eileen @ FamiliesGo! on July 28, 2013 at 11:40 a.m. I resist to urge to teach TT about nature. I let her sing songs, make up stories, pick up rocks and stones and pretty much anything else she wants to do that distracts her from how far she's walking.